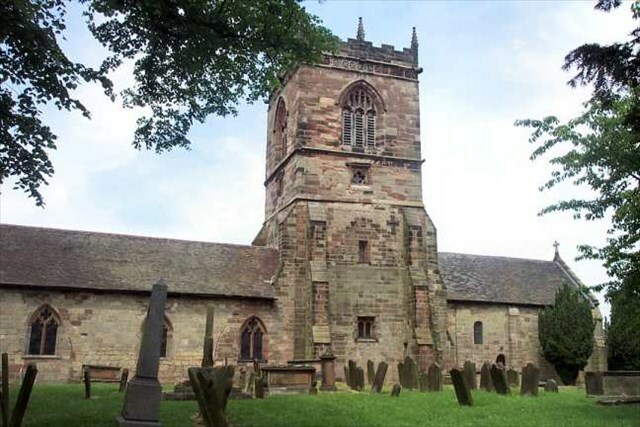 The church of All Saints at Lapley probably dates from the late 11th or early 12th century. The nave and chancel are clearly Norman in age, along with the lower part of the tower, but the upper portions appear to be 15th century. The church possesses many ancient and unusual features and has been radically altered several times in its history. "An ancient map shows the Chapel of Ease was situated here before 1577. The present church was dedicated by Bishop Lonsdale of Lichfield in 1857." Of special interest is the Dutch carved 11th century font depicting seven scenes from the life of Christ, which was discovered discarded in a local farm in the 19th century and then reinstated into the church. "The font is unusual and consists of a base and pedestal supporting a wide octagonal bowl lined with lead. Carved scenes tell the story of the birth of Christ. The font is of early Dutch origin, no one knows how it came to Lapley.